Fungus is one of the most resilient living substances on the planet. Because of this fact, fungal infections are very difficult to eliminate and can spread from one body part to another. In fact, a very large number of people who suffer from nail fungus more than likely had a fungal infection of the skin to begin with. 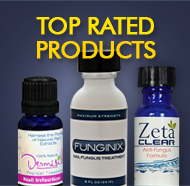 Toenail fungus infections occur when a fungal infection of the skin penetrates the nail either through a small cut, crack or break in any of the nails. Understanding how to keep from ever getting a skin fungus infection will go a long way towards preventing a nail fungus infection. Athlete’s Foot, ringworm and jock itch are fungal infections of the skin. Generally speaking, these infections are found in places that are moist and warm and where the skin is not especially well cared for. Even those that shower regularly and use lotion to protect their skin often neglect the “hard to reach” areas of the body like our feet and the region around our reproductive organs. If the skin around these parts of the body is not cleaned and keep moisturized regularly, they become a breeding ground for fungal agents. First and foremost, good hygiene and the regular cleaning of ALL of your skin is essential. Whether you like to take showers or baths, be sure to thoroughly clean all of your skin each and every time. Neglecting a part or parts of the body will simply increase your risk of contracting a fungal infection. These agents that cause skin fungus thrive on the dead tissue on the ends of hair and nails as well as dead skin tissue on neglected feet or other body parts. Skin fungus infections on any part of the body are generally marked by dry, flaky or crackling skin of some kind. In Athlete’s Foot, this frequently occurs on the heels of the feet or between the toes. An itching or burning sensation in these areas accompanied with an irritated or red patch of skin is a dead giveaway. Jock itch symptoms are nearly the same but the area in question is obviously the region around the groin. Ringworm is the most easy infection to spot due to the circular, reddish rash that appears on the surface of the infected skin. In conclusion, it’s important to understand that contracting a skin fungus is a gateway for the larger, more irritating problem of a nail fungus infection. If you want to avoid toenail fungus, take care of all of the skin on your body in order to not let any fungal agents settle in. Good hygiene and responsible treatment of your skin can ensure that you never have to battle a fungal infection. This entry was posted on Wednesday, February 20th, 2013 at 6:16 pm and is filed under Causes of Nail Fungus, Nail Fungus Symptoms, Preventing Nail Fungus. You can follow any responses to this entry through the RSS 2.0 feed. You can leave a response, or trackback from your own site. vicks works… do you keep applying it to all of the toe nails for just in case or also keep applying until completely gone…/????? Hi Debra, and thanks for commenting! We have had heard several success stories from readers who have used Vicks VapoRub. Presumably, you would apply Vicks like other topical solutions which would be once in the morning and then once again in the evening. And be sure to continue applying for a couple of weeks after it appears as though the fungus is gone in order to kill and eliminate the most difficult fungal agents.